I am trying to Create a new Repository. 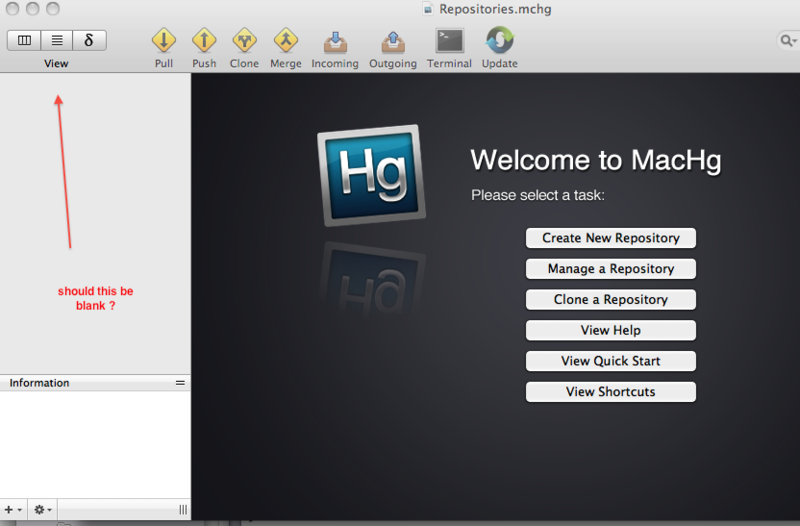 then click 'create a new repository and choose shortname=htdocs, local path=/Applications/MAMP/htdocs . If I click Manage Repository, then it just goes back to 'Welcome to MacHg' it just starts again asking again to Create Repository. That's really weird. That is what you should be doing. You have the latest version of MacHg right? What version of OSX are you on? Can you try that with a test folder with say a couple of text files inside it somewhere else besides the applications folder? Since it is saying "Manage Repository" it means you have previously set up a repository there or it thinks you have. Can you experiment with this. That sounds semi serious and I will like to know if there is a real problem here on a specific machine / setup / configuration. You have watched the screen cast right? jason closed this discussion on 20 Dec, 2011 01:30 PM. > version of MacHg right? What version of OSX are you on? > somewhere else besides the applications folder? > files, but there is no mention of it in the left top pane. > from my download folder. > repository there or it thinks you have. > if there is a real problem here on a specific machine / setup / configuration. > You have watched the screen cast right? > the problem. Perhaps you shoul warn new users of this issue. I had this exact same problem but after finding this in the support was able to get it resolved as well by following these steps. It is working splendidly now but just thought i would let you know it wasn't an isolated incident. Now that it is working I really like it. well done on the program! Thanks for the update Ky! I'll make this a general knowledge base item! jason closed this discussion on 26 Jan, 2012 09:32 AM.